Ouch! What a bite! BooBoo takes a ride in the DaDa Trk. 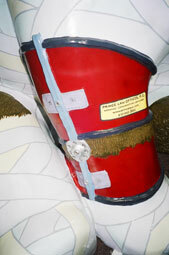 His injuries include a damaged ear. What a poor, poor puppy! BooBoo looks pitiful in this photograph. Bloodshot, dazed eyes allow us to feel his pain. Poor baby! BooBoo has a broken leg, but his cast shows the support his friends at Prince Law Firm will provide during his time of need. Support comes in assorted ways: physical, emotional, and legal. Prince Law Firm handles workmen's compensation cases, offering support to those who suffered from job-related injuries. 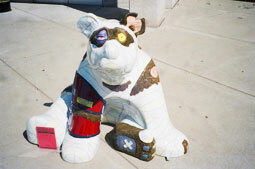 Alan MacBain's BooBoo debuts at BASH's 2006 Arts Expo. Alan MacBain, a cartoonist and illustrator is fun and funny, someone who sometimes enjoys bending the rules, someone who is always curious about what will happen next to challenge him. Alan was curious to see how other artists met the Bear Fever challenge through their diversity of styles and approaches. Provoking a smile is Alan’s goal, and he certainly achieved it with both “Bubbles,” his first creation, the O’Brien and Gere bear, and with “BooBoo” too. Alan offers this ‘toon character a Warner Brother’s-inspired face using Magic Sculpt. Poor baby. 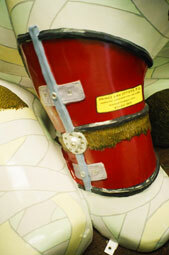 BooBoo features many details symbolizing assorted injuries. 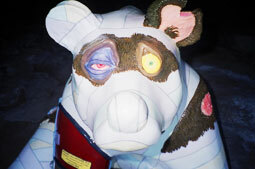 You’ll find his body encased in a “plaster cast.” He is sporting bandages, braces, nails and screws and relaying on his hot water bottle for comfort. Will folks want to sign his cast and wish him well? We’ll see. 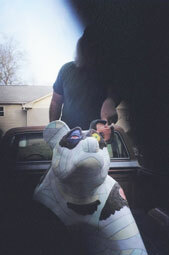 Prince Law specializes in handling Workman’s Compensation cases and was eager to have their bear look wounded. “BooBoo” certainly looks pained and would “feel your pain” too.